THE DESIGN SHOPPE, INC. has been serving south Hillsborough County for over 25 years including the communities of Sun City Center, Wimauma, Apollo Beach, Riverview, Ruskin, Valrico and Brandon. We now offer our products and services in Manatee and Sarasota counties including the communities of Bradenton, Lakewood Ranch, Ellenton, Palmetto, Parrish, Sarasota, Anna Maria Island, and Long Boat Key. We are a full service, family owned and operated furniture store specializing in interior design and custom window treatments. We offer quality products at affordable, competitive prices and provide professional installation and delivery services with all of our products. Whether you need a single blind or an entire house full of window treatments and furniture, our one stop 6,000 square foot showroom is the place for you. Our professional design consultants will assist you every step of the way, providing every customer with unique solutions for their specific challenges. Stop in our showroom or call for a complimentary design appointment today! One of the newest, hottest products in the custom window coverings industry are transitional shades. Transitional shades are creative, contemporary, and are guaranteed to make a style statement! 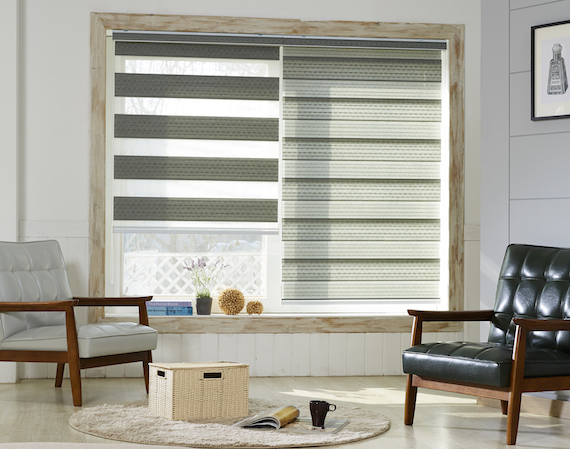 We offer motorization for roller shades, cellular shades, woven woods, horizontal blinds, and window shades. Motorized window coverings are cord-free and offer a wide range of control options. Motorized shades can be programmed to operate on a schedule, or to operate based on the temperature in the window. They can even be operated remotely from anywhere in the world by using your smartphone. Motorized window treatments unleash a new level of creativity and convenience.